Operation Legacy projects aim to engage veterans, families of the fallen, and civilians alike, by activating them to lead and serve others in their communities. “By bringing communities together to serve in honor of our fallen heroes, we are not just keeping their legacy alive, we are passing their values along to the next generation of leaders." 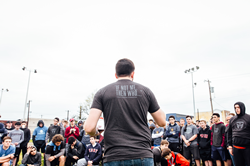 Operation Legacy is the fastest growing movement to unite communities across the nation to create positive change, where more than 3,500 participant are expected to volunteer as a way to honor the legacies of our fallen heroes. Each project across the country will be dedicated to a fallen military hero, who will be recognized during an opening ceremony. Select projects will also include a GORUCK component, where following the service component volunteers will ruck two miles or more carrying a weighted backpack. Operation Legacy projects aim to engage veterans, families of the fallen, and civilians alike, by activating them to lead and serve others in their communities. Americans across the country are invited to volunteer with TMF for Operation Legacy, as a way to honor the past and build the future, while exemplifying the strength of America’s national character. All projects have been organized by local volunteers, who are helping to unite the community through service, and encouraging their neighbors to live by the “If Not Me, Then Who…” mantra to spearhead a movement of character, leadership, and selfless service. “Operation Legacy project leaders and volunteers exemplify the strength of America’s national character, by bringing together veterans, families of the fallen, and inspired civilians to unite for the common cause of making a positive impact in their own communities,” says Amy Looney, wife of Lt. (SEAL) Brendan Looney and Vice President of TMF. “By bringing communities together to serve in honor of our fallen heroes, we are not just keeping their legacy alive, we are passing their values along to the next generation of leaders." Those interested in volunteering for upcoming projects can register or learn more information by visiting http://www.oplegacy.com. Those unable to attend this project can also start their own project by signing up as a Virtual Volunteer. Those interested in volunteering for an Operation Legacy Service Project can register at www.oplegacy.com.